Streamline your genome editing workflow with purified Cas9 protein bundled together with the T7 gRNA Cloning and Production Kit. 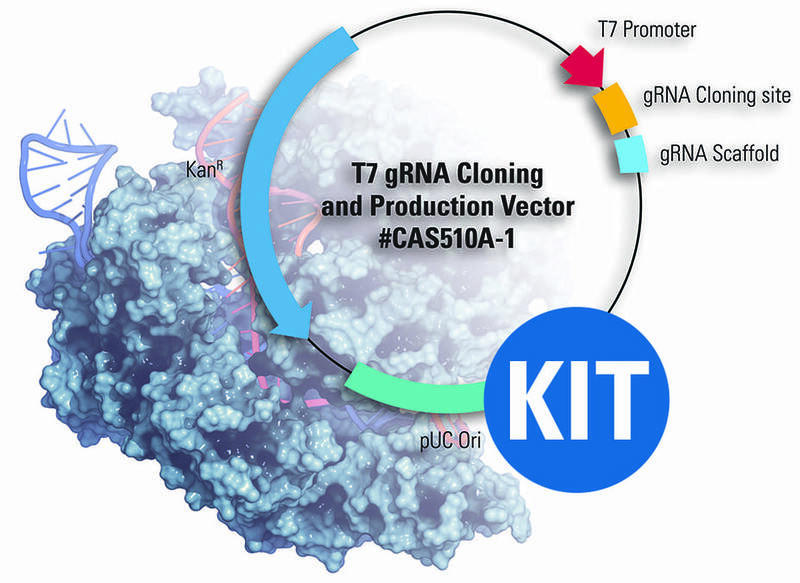 Combining a T7 gRNA SmartNuclease™ Synthesis Kit with purified, transfection-/electroporation-ready Cas9 protein gives you everything you need to target your Cas9 genome editing activity to a specific genomic site (note that many applications including gene knock-outs, knock-ins, and edits also require the use of a homologous recombination (HR) targeting vector—see our CRISPR/Cas9 tutorials to learn more). Cas9 Protein & T7 gRNA SmartNuclease™ Synthesis Kit includes Purified Cas9 Protein (Cat.# CAS400A-1) and the T7 gRNA SmartNuclease Synthesis Kit (Cat.# CAS510A-KIT). The T7 gRNA SmartNuclease Synthesis Kit comes with a pre-linearized, ready-for-cloning gRNA expression vector and all the reagents you need for T7-driven in vitro transcription of your cloned gRNA. Ramakrishna, S. et al. Gene disruption by cell-penetrating peptide-mediated delivery of Cas9 protein and guide RNA. Genome Res. (2014). 24:1020–1027. PMCID: PMC4032848. Wang, L. et al. Large genomic fragment deletion and functional gene cassette knock-in via Cas9 protein mediated genome editing in one-cell rodent embryos. Sci. Rep. (2015). 5:17517. PMCID: PMC4664917. Chen, S., et al. Highly Efficient Mouse Genome Editing by CRISPR Ribonucleoprotein Electroporation of Zygotes. J. Biol. Chem. (2016). 291(28):14457-67. PMID: 27151215. Using SBI’s transfectable or electroporatable Cas9 protein is quick and easy. Simply pre-incubate Cas9 protein with your gRNA and then either transfect or electroporate as normal. While a 1:1 ratio of Cas9 protein to gRNA was used for the study in the Supporting Data section below, we recommend optimizing the amounts and ratios for your specific gRNA and cell lines. Figure 1. Rescue of a non-fluorescent eGFP mutant using Purified Cas9 Protein. Rescue of non-fluorescent eGFP mutant (EGIP) via homology-directed repair using either a Cas9 All-in-one plasmid system (left panel) or a Cas9 protein-gRNA system (right panel), three days post-transfection. Direct transfection of Cas9 protein-gRNA results in a higher rescue efficiency.